The people at NRS believe that you, our customer, deserve the best. We give you high-quality, affordable gear and service that's friendly, fast and efficient. 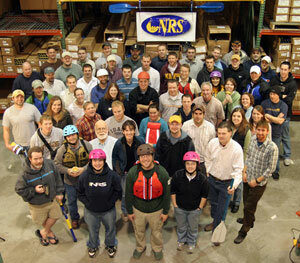 Bill Parks, our Founder and President says, "I created NRS to be the kind of company I would want to do business with. We treat our customers in the way we like to be treated." We manufacture an extensive array of rafts, catarafts and inflatable kayaks, plus a complete line of apparel and accessories for all types of boats and boaters. Our apparel spans the range from base layers like our sun protective HydroSilk to fully protective dry suits, wetsuits and all the gloves, footwear and life jackets you need for comfort and safety on the water. We also partner with other top-of-the-line companies such as Werner, AIRE, Kokatat, Carlisle, Cataract, Astral, Extrasport and Aquapac to bring you even more choice in gear. If you enjoy any type of watersport, we have gear for you. If you call us, a friendly, knowledgeable human answers the phone. Our website is a goldmine of helpful tips and instruction. Our Associates are boaters. We share your passions for the outdoors and the water world. We look forward to helping you plan and outfit your adventures.